Apple is the most preferred smartphone brand in the United States followed by Samsung and Motorola, according to a new report from market research firm Kantar Worldpanel. On the other hand, in Europe‘s big five countries (EU5) - France, Germany, Spain, Italy, and the UK - Samsung leads the race, followed by Apple and Sony. 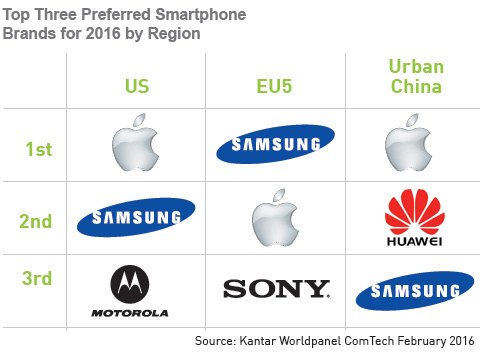 The iPhone maker is also the most preferred choice in the urban China region, followed by Huawei and Samsung. The report notes that around 46% of the total smartphone users in the US are currently planning to upgrade their smartphone over the next 12 months. That figure is 48% in EU5 and 28% in urban China. "In the US, 40% of consumers planning to change their device prefer Apple, and another 35% prefer Samsung. Then, there is a large gap before we get to Motorola (6% preference) and LG (5%). In the EU5, the leadership position among preferred brands is reversed, with Samsung at 37% and Apple at 29%," said Carolina Milanesi, chief of research at Kantar Worldpanel. The report also says that the high-end smartphone market has saturated in regions like the US and EU5, and going forward, companies will have to convince die-hard feature phone users that they need a smartphone as well as persuade existing smartphone owners that they need the "next big thing." Currently, in the US, mobile phone penetration has crossed the 90% mark, and of those, 65% are smartphone users, the report notes. US consists of 50 states. Very wise people indeed!